Adding Trailer Backup Camera to '13 FX4 with existing tailgate camera - Ford F150 Forums - Ford F-Series Truck Community. I have a 2013 FX4 SCrew with the MyFordTouch 8” screen and backup camera, and I have a 30 foot travel trailer. I want to add a backup camera to the back of the trailer. Due to the length of the trailer + the truck, I don’t want to go with a wireless unit because I’ve read about range issues with the wireless models. I’d rather avoid pulling any new wiring through the truck, and using the built in screen seems more convenient than mounting a new screen that is probably smaller and lower resolution. I’m thinking that I’ll buy a third party camera and wire it to a harness/pigtail that matches the harness used by the tailgate camera. Then I’ll just swap the connections as needed (plug/unplug). I’m trying to keep it as simple (and cheap) as possible so something like Lockpick is overkill. I’ve found some forums covering similar topics, but not one that is quite what I’m looking at. If anyone could provide feedback on my plans it would be appreciated. First questions: Is that the right pigtail and am I better off buying and cutting the harness or buying the pigtail. 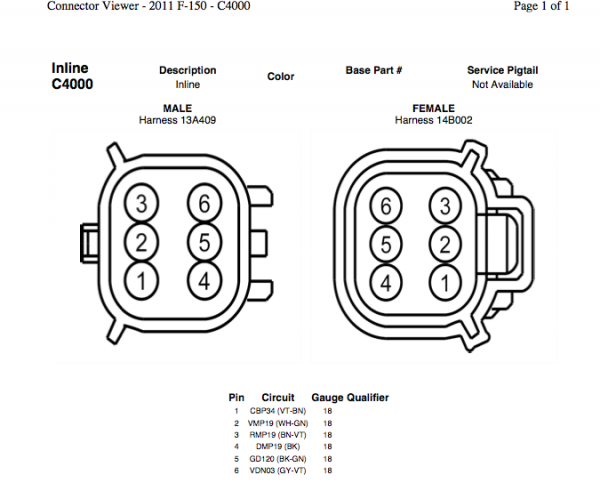 One problem is that I’m not positive that that pigtail is the right one and I won’t know until I order one (that part comes up as a connector for rear lights/signals). I’m 99% sure that the harness is the right one, but it seems like a waste to have to cut it. 2. Next, the wiring from the camera harness to the back of the trailer. 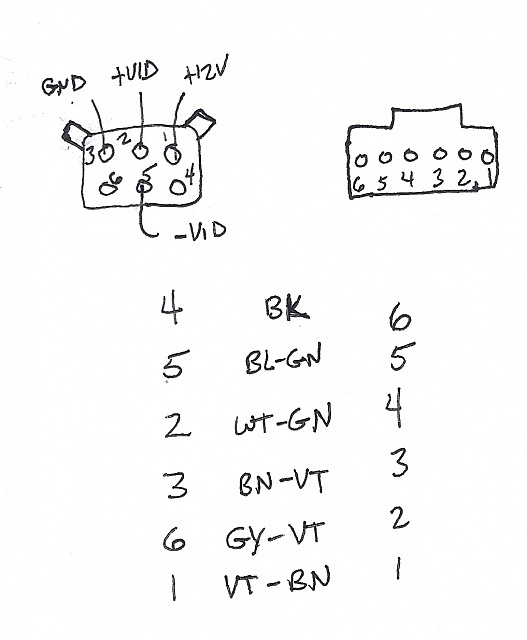 I probably want to buy about 50’ of wiring, and I believe that I need four wires. - is it four wires that I need? - recommendations for type, gauge, waterproofness, etc? 3. Pinouts. Depending on which camera I go for, I’ll need to figure out the pin-outs. From reading through other forums, I believe that I need to make sure that the camera is 12V and that there will typically be a power cable and a video cable, both with two wires. Is that correct (i.e. 2 video wires and 2 electrical wires) from the camera? 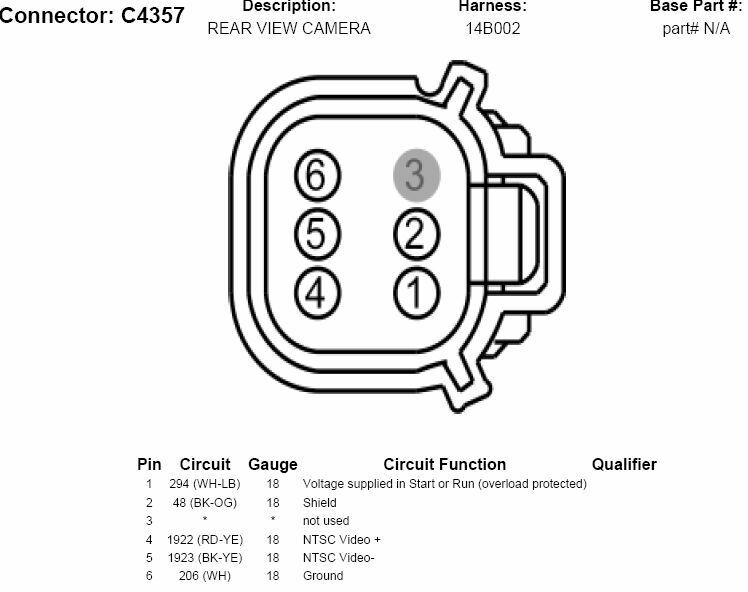 Does anyone know the pin-outs for both ends of the camera harness for the 2013 FX4? 4. Camera. Any thoughts on a good camera to use? If I go third party (e.g. ebay or Amazon) then I don’t want anything very expensive ($30 - $40). Should it have alignment guides or not? Night vision? Resolution? 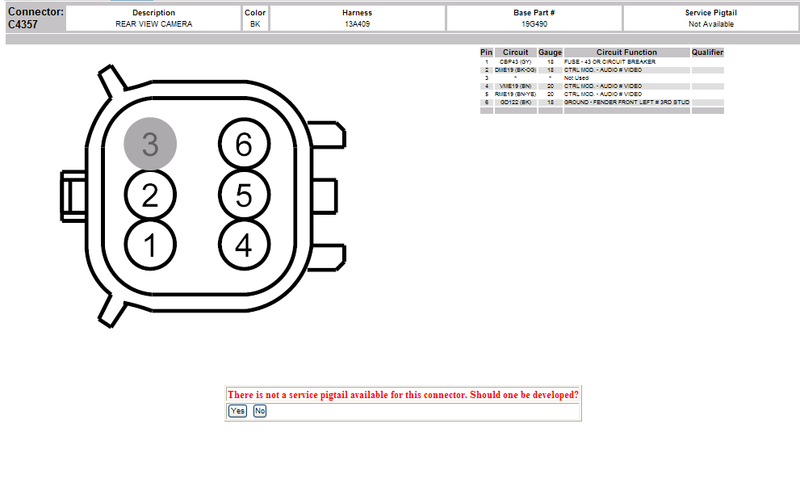 Alternatively, if I go with a Ford OEM camera I don’t have to mess with pinouts (except to cut the harness and splice in 40’ of wiring) and I already know what the picture quality will be and how it will work with the existing system. The downside will be that I need to figure out good way to mount it on the trailer. According to the FordParts site, the camera + housing/bezel would be about $160. So, third party (harder to wire/pinouts, easier to mount, cheaper, night vision) or OEM camera (100% compatible, easy wiring, harder to mount)? Also, does anyone know why fordparts.com lists the camera + bezel + harness + screws/clips for a total of about $210, but most online sites list the package for $300 - $400?